Executive chairs stand out from other office chairs for their ergonomically advanced features and sophisticated styling. Sleek and comfortable, these have an authority and flair unmatched by other types of office chairs. These usually feature full-swing chair mechanism, densely cushioned leather seats, adjustable PU padded arm-rests with recline support and much more for ultimate seating comfort. Considered to be the epitome of craftsmanship and advanced ergonomic design, Executive chairs like Marco 1007 H or Marco 1011 H are crafted for the corner office, CEO office to complement their power and stature. Unlike ordinary chairs or semi-ordinary chairs, Executive chairs such as Marco1005 H or Marco 1011 H come with high backrest which gives better lumbar support and helps maintain the natural ‘S’ curve posture of your spine. Further the patented design 4 way adjustable mechanized head rest offers better support to head and neck muscles. Together it contributes to better seating posture with better trunk weight support. All of HOF executive chairs come with world-class ergonomic design and solid build quality. 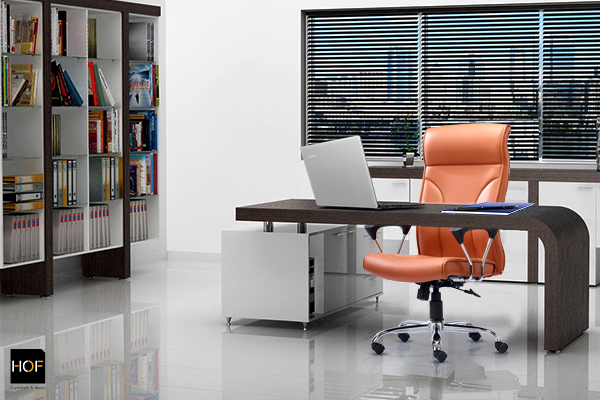 Executive chairs are specially designed to offer full support to the body. These feature multi-function chair mechanism to that allows backrest and seat to adjust independently of each other as well as independent of the tilt, thus providing better recline support that adjusts to your body. Executive chairs score high on functional and aesthetics, thus feature full-grain leather or leatherette for the distinct premium look. HOF Executive chairs come with excellent lumbar support and extra-soft padding for better comfort. The five glass filled Nylon casters have very high load capacity and reduced friction when rolling to improve flexibility and performance. The swivel base with anti-topple chrome polished base further adds to the functionality and appeal of executive chairs over other office chairs. Executive chairs feature ergonomically designed adjustable PU-padded arms with Aluminium cast, chrome and veneer wood polish for sophisticated styling and enhances comfort. These offer thick padding that is both visually appealing and comfortable. Discover the stunning collection of executive chairs online at unbeatable price and attractive offers today to give your corner office a luxurious makeover. « Why Your Favorite Office Chair Must Have Adjustable Lumbar Support?